After writing a couple of articles I realized that some people do not know that there are both open and closed cellphones. Open devices allow you to create and load applications on the device where closed devices do not. Open devices, for the most part, include Symbian, Windows Mobile and sometimes Linux. Some examples of open devices include the Nokia N95, N73, E62 and Palm Treo 700w (Windows Mobile). The reason that I am making a point of explaining open versus closed is that you will need the Flash Lite player installed on a device in order to player converted Adobe Presenter content. Adobe makes developer versions of the Flash Lite player available for download on the developer network site. For the time being the only Flash Lite 3 player available is for Symbian (e.g. N95, N73, etc…). I would assume that there will be a Windows Mobile version later this year but if you want to get started today and do not have an open handset buy a Nokia device with the Symbian OS. Because Flash Lite requires a decent amount of performance and memory I would buy an N95 or an N73 or equivalent. The Nokia N95 8GB has Flash Lite 3 integrated into the browser. Before you get too happy I tested Presenter content on this device using the browser with Flash Lite 3 in a number of different scenarios including accessing the content on a Connect server, using an html wrapper for the viewer-lite.swf on a standard web server and using an html wrapper for the view.swf on a standard web server and none of the scenarios loaded the content. There seems to be a problem playing Adobe Presenter content using http, I would assume that at least in part the problem is a security sandbox issue as there is no way to set the security settings for the converted Adobe Presenter content. In addition to the previous issue there is a strange bug that affects the ability to play video on the N95 8GB, when you play a slide that has embedded video the screen rotates to landscape. This is not a problem if you are already in landscape mode. I would assume that Nokia will have a fix for the video problem soon but for now I would stick with content loaded onto an Nokia N95. I will use the term device and Nokia N95 (non-8GB model) interchangeably in this article. The object of this article is to show how you can create content using Adobe Presenter 7 that will run on an open handset running Flash Lite 3. If you are not familiar with Adobe Presenter check out the following example . If you are still looking for additional Adobe Presenter information you will find a number of PDFs that go into some detail on the resource site for Adobe Presenter and Adobe Connect. It should go with out saying that we need to use every available pixel of these small screens for content. With that said it should also be obvious that some content will simply not work on some devices based on the resolution of the device, input device requirements(mouse) as well as memory and processor requirements. There is an unwritten rule that you should not use more that five or six bullets on a slide when creating a PowerPoint presentation. I would say that when creating a presentation for a small screen that it should be more like three or four bullets at most. Using a larger font will go a long way to improving readability of text. In addition the issue of readability is abrogated to some degree by adding audio to the presentation using the Adobe Presenter plug-in. In the following the image on the right is a screen capture of the original slide from a PC and the image on the left is a screen capture from a Nokia N95, with a 320 by 240 resolution, running the converted content. As you can see the fidelity of the conversion is very good. The image is scaled and placed correctly as is the text content. The image should also help make the point that it is a good idea to use a slightly larger font if you are thinking of using the converted content on a device with a small screen. The original image that was added to the presentation was approximately 4004KB. The size of the slide with out the image was approximately 1KB. When I added the image and published the presentation the slide with the image was 231KB. This is still fairly large for some devices, you may want to optimize your images before adding them to PowerPoint and converting them with Adobe Presenter. There are several problems that may or may not be obvious with the preceding content image. First the content requires a mouse to start, stop and pause the content not to mention use the sidebar functionality (thumbs, notes, search), most cellphones do not have a mouse. Second too much screen real estate is used by the sidebar. Third the images of the headphones and microphone are too big for small screens. The good news is that Presenter 7 addresses most of the issues for us either during the publish process or at runtime. When you publish the PowerPoint content using Presenter 7 there are two swf files, used as viewers, created in the publish folder the viewer.swf and viewer-lite.swf. The viewer.swf is the file that is used to play the content on PCs while the viewer-lite.swf is the file used to play the content on non-PC devices with a minimum client requirement of Flash Lite 3. The view-lite.swf solves some of the previously mentioned issues by removing the mouse requirement and not loading the sidebar. 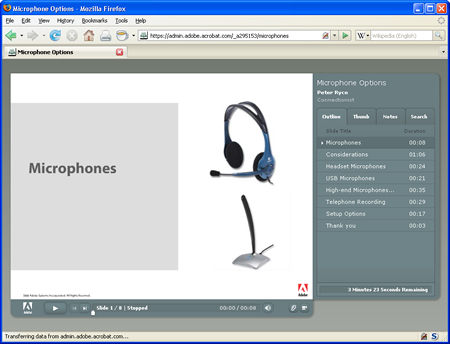 Audio works the way that you would expect it to in Adobe Presenter content. The Presenter plugin for PowerPoint gives you the ability to record and edit audio for each slide in the presentation. When the viewer-lite.swf and the data folder are moved to the device you will hear the recorded audio for the given slide. Video is a favorite media type for learning content authors. Adobe Presenter allows a content author to import and set preferences for video. When importing video you have the option to place the video on the slide or the sidebar. In order to use video in content converted by Adobe Presenter on a device the video needs to be placed on the slide not the sidebar as the sidebar will not be loaded by the viewer-lite.swf. As a test I imported a Quicktime video that was fairly small (200 x 160 pixels) and set the placement to slide and the datarate to 400kbps. The video played well with no visible dropped frames and decent quality audio on a Nokia N95. Adobe Presenter gives the content author the ability to create and reuse themes as well as the ability to retain custom animations created in the PowerPoint presentation. Since a different viewer is used to play converted content on a device(viewer-lite.swf) than on a PC (viewer.swf) and that viewer does not support themes, they are not retained. Custom animations are created in PowerPoint and retained after conversion by Adobe Presenter. I tested several custom animations including Fade, Dissolve In, Fly In, Checkerboard and Spin and all worked as expected on the device. 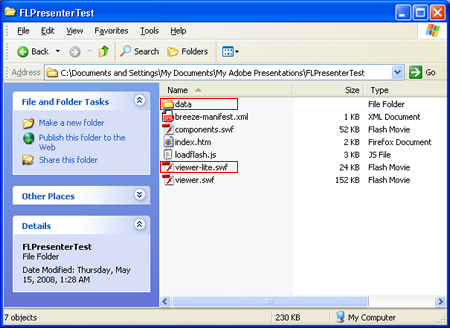 Using Adobe Presenter a content author has the ability to import Flash content and place it on a slide or the sidebar. As mentioned previously the Flash content will need to be placed on the slide not the sidebar. Most Flash content imported using the Adobe Presenter plugin for Powerpoint is retained but will have limited use on devices based on the limited input options available on devices. For instance the lack of a mouse means that you use the navigation keys on the device to advance the converted PowerPoint slides. Which means that the content author cannot use those keys to interact with imported Flash content. It would be helpful if Adobe Presenter had a method for remapping the keys used for slide navigation to adjust for the input requirements of the imported Flash content. Since content converted by Adobe Presenter uses different keys to advance slide content on the device based on the orientation of the content it is impossible to use the devices navigation keys for Flash content as it would move the slides forward or back. If you could remap the keys you could have converted content always use the same navigation keys to advance the slides. For instance when you start the presenter content in portrait mode the right navigation button on your 4-way rocker is used to advance the slide content. When you switch to landscape it is the down navigation button on your 4-way rocker that advances slide content. This will limit the amount of interactivity that you can expect on a mobile device as the author of the Flash content would have to take into account whether the slide content was in portrait or landscape mode. One solution would be to use screenResolutionX and screenResolutionY from the Capabilities class in your Flash content to figure out if the content is being run in portrait or landscape and adjusting input keys accordingly. Fonts can also be a source of confusion when targeting a device. I recently found that the use of device fonts, fonts that rely on the host to have the type face, do not work in Flash content imported using Presenter. If you use a font such as Arial or Times New Roman the outlines are embedded with the content and work well. If you have dynamic text you will need to embed the characters you intend to use (e.g. Lowercase, Uppercase, Numerals, etc…). Adobe Presenter allows the content author to create or import a quiz that will be published with the other content from the presentation. Unfortunately the quiz functionality from the Presenter plugin for PowerPoint is not supported when using viewer-lite.swf as the viewer on a device. A nice feature for a future release would be to enable quizzes with out reporting so that learners could at least test their knowledge of a subject. Of course it would be great to get reporting as well but this would be a good first step. Another important consideration is how will the content author get the content onto the device. Since, as previously mentioned, it is not possible to access Presenter content from a device using a browser (http) the content, for now, will need to be manually loaded onto the device. I am hoping that someone proves me wrong on this point as it would greatly increase the usefulness of this content if it could be accessed across the Internet. The good news is that you will find it is a simple process to load content onto the device using Nokia’s PC Suite. From the following image of the Adobe Presenter publish directory you will notice that there are six files and one directory. You will only need to move the viewer-lite.swf and the data directory to the device in order to play the content. You can leave behind all the other files as they will not be used on the device to play Presenter content. The ability to play content from Adobe Presenter on a mobile device is a welcome ability that portends the beginning of a trend that I have been talking about for some time, mobile learning. With that said there are a few features that I would like to see added to the product in future releases.